... it's "natural variability". Global warming is still there - you're just too stupid to notice. This will, of course, apply to this coming year as well, even though it's going to be cold. We are so lucky to have these dedicated scientists to tell us what is really happening. Much more on Climate Depot. ... that they should experience global warming for themselves. Could be cheaper in the long run. Definitely no comment. I'm saying absolutely nothing. "Natural catastrophes have left the world's insurers with a claims bill totalling $22 billion (£13.7 billion) this year as the number of disasters linked to climate change increased markedly." So writes Miles Costello for The Times, adding to the steady drip of MSM propaganda to reinforce the proposition that "climate change" – i.e., global warming – is a serious problem. Yet the source of this information is Munich Re, the German reinsurer. It has issued its annual assessment of catastrophe losses, noting that, although overall losses were dramatically lower this year than last, the number of destructive events was higher than its average over the past ten years. Spokesman Peter Höppe, head of the company's Geo Risks Research division, is unequivocal. He says: "We should make no mistake: despite the lack of severe hurricanes and other mega-catastrophes, there was a large number of moderately severe natural catastrophes. In particular, the trend towards an increase in weather related catastrophes continues." 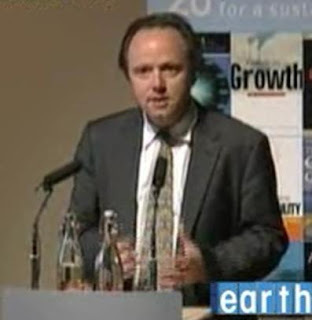 Höppe goes on to assert that: "Initial analyses indicate that, apart from socio-economic factors, this is already due in part to climate change," on which basis his company argues that there is an "urgent need" for international agreement to reduce the greenhouse gas emissions that cause climate change. However, what is lacking entirely from this account is any indication of the Munich Re's motivation for spreading its concerns about "climate change", or any suggestion that it might be a partisan player - at several levels. In the immediate term, the catastrophe re-insurance market - as Höppe hints - has had a good year, with no major payouts. This is leading to pressure to reduce premiums, so the climate change "threat" is thus being used as a counter - as outlined here. For the longer term, we have to look elsewhere for the motivation, to the Centre for Climate Change Economics and Policy jointly funded by the London School of Economics, Leeds University, the Economic and Social Research Committee – and Munich Re. Within that unit we find the Munich Re programme. Scrutiny of this quickly dissipates any suggestion of altruism or neutrality on the part of the company. The heading of the programme is: "Evaluating the Economics of Climate Risks and Opportunities in the Insurance Sector". Mitigation and adaptation activities will bring about a plethora of new financial products, introducing new risks and opportunities into the financial sectors. This research package will explore the impacts of alternative approaches to carbon finance and emission trading for different industries, informing the design of trading schemes and new financial service products. The second phase of the package will investigate how better balance investment between mitigation and adaptation, survivability and sustainability from the perspective of market participants. 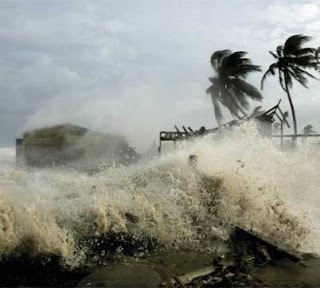 Thus, the very evident concern of Munich Re is to exploit the financial opportunities created by climate change, its enthusiasm for talking up the "threat" clearly influenced by its perception that there are major gains to be made. In espousing the cause of climate change alarmism, however, it is in good company. The Centre steering committee, on which Peter Höppe sits, is chaired by Lord Stern. It counts amongst its members Dr Keith Allott, head of climate change, WWF-UK, Antonio Hill, senior policy adviser for climate change, Oxfam GB, Ronan Palmer, chief economist of the Environment Agency, and Richard Price, chief economist, Department for Environment, Food and Rural Affairs (DEFRA). The presence of Richard Price from DEFRA is particularly apposite for, alongside him is a now familiar figure, none other than Ritu Kumar, director of TERI-Europe. TERI-Europe, of course, is carrying out its own study "investigating the exposure and potential of the Indian insurance industry to cover risks related to climate change". This, remarkably, is funded by DEFRA and "links have been established" with Munich Re, as we now see from Kumar's participation on the Steering Committee of the Centre for Climate Change Economics and Policy. This makes for one real busy lady. But what it also makes is one giant scam. Whatever the original motivation of the climate alarmists might have been – and one can concede that many people have been genuinely concerned about global warming – the issue has now been hijacked by the money men and the financial institutions, who are intent on exploiting the "opportunities" afforded. In a small step sideways from looking at TERI-Europe, we need to pick up a few loose ends before progressing the story. We thus return to Ritu Kumar, whom we met in an earlier piece. She has it seems a taste for directorships, and is turning out to be a past master at multi-tasking. It is not enough for this lady that she should be a director and company secretary of Pachauri's little enterprise, TERI-Europe, the Executive Director of the Sustainable Trade and Innovation Centre (STIC), a consultant to the Commonwealth Science Council and a senior adviser for Actis UK. For the idle moments in her otherwise busy life, she as acquired another directorship, this time of a company called Investor Watch, formed on 27 April 2009. Her co-directors are Cary Krosinsky and Mark A Campanale, the latter being responsible for company research on the Jupiter Merlin Ecology Fund, the Merlin International Green Investment Trust PLC and the Skandia Ethical Selection Fund at Jupiter Tyndall Merlin. Having placed the marker, we will return to these two gentlemen and their shared enterprise in due course. Both have very interesting links into the green movement. But we need also to look briefly at another of Kumar's co-directors of this newly-formed company, none other than Nicholas Vivian James Robins (pictured). It is he, we ascertained in our previous piece, shares ownership of 27 Albert Grove with Ritu Kumar, the rather unlikely registered office of Pachauri's TERI-Europe. Both give this address as their residence. Amongst his other activities, he is a leading light in the Network for Sustainable Financial Markets but his current paying day-job is director of the HSBC's Climate Change Centre of Excellence, which he joined in late 2007. He started off his career with the Economist Intelligence Unit, moved to the EU Commission's Environmental Directorate and thence to the Business Council for Sustainable Development. From there moved to the International Institute for Environment and Development, before ending up with Henderson Global Investors, where he was head of SRI (Socially Responsible Investing) funds prior to joining HSBC. If this is an interesting snapshot of a green activist pursuing his career path, what Robins does not reveal in his general cv (apart from the fact that he is living in the "head office" of TERI-Europe, prop. R K Pachauri) is that he is an active member of the Green Party - and has recently been a generous donor, contributing £5,500 to the party coffers. Moreover, he stood for election as a councillor in the 2006 local elections in his home area, the London Borough of Merton. Here, strangely, there is a link with TERI, because TERI-Europe claims as one of its "partners" the London Borough of Merton which it assisted in "organizing a major seminar on energy efficiency and in incorporating renewable energy technologies in building design." Why a suburban London Borough should need the help of the European arm of an Indian "think tank" is not explained. Even less so is why the seminar was funded by the European Union under its €42.3 million "Asia Urbs " project. However, as first sight, this looks to be a mechanism for channelling EU funds into TERI. Was Robins involved? Whether there was a link, there is certainly a more tangible association between Robins's employer, HSBC, and an offshoot of TERI-India known as the TERI Business Council for Sustainable Development (BCSD). In partnership with this organisation, the HSBC proudly sponsors the Living Business SME Award. Whether there is link between Robins and this award, again is not stated, but HSBC have certainly benefitted from their sponsorship. On 5 February 2009 at the Delhi Sustainable Development Summit, Naina Lal Kidwai, Group General Manager and Country Head, HSBC India, was presented by Dr R K Pachuri with the "prestigious" Green Globe Award in the business enterprise category "for her commitment to environment sustainability". Sponsored by the newly-formed Green Global Foundation, the initiative of the Indian Film Academy and Wizcraft International Entertainment, UNEP and TERI, headed by R K Pachauri, are the partners of the foundation. Friends of R K Pachauri, it seems, tend to do rather well out of their association with the man. On being leader of UKIP. The man actually comes over as a human being ... that will never do. We can't have that in politics. Devil's Kitchen is on the trail of Actis and Dr Pachauri's funny money. Birds of a feather, it seems, flock together. The Foreign Policy magazine ranks the "top 100 global thinkers" of the year, putting Rajendra Pachauri in fifth place – for ending the debate over whether climate change matters. He beats Bill and Hillary Clinton, who share sixth place. President Obama is placed second – which really tells you all you need to know. Part of the great global empire controlled by Dr Rajendra Pachauri is an organisation called TERI-Europe. And, like everything to do with Dr Pachauri, it is not quite what it seems, apparently enjoying a flood of grant-funded work, yet living off thin air. Everything about the organisation is shrouded in mystery and even the most straightforward of details raise serious questions about its operations. For instance, the organisation was incorporated on 10th June 1999, its articles then amended by special resolution dated 2 September 1999. But, although it is registered as a charity, it seems to be running an accumulated deficit over the last five years. In its year ending 30 June 2004, it reported an income of £21,286 yet showed an expenditure of £35,403. The following year, it attracted a paltry £456 yet still managed to spend £24,379. For the next two years, it took in £7,000 and £9,000 respectively, spending £8,100 and then £5,000. In its year ending 30 June 2008, it made £8,000 and spent £3,000. Grossing just over £45,000 in the period, that left it short by about £30,000. Nevertheless, this "charity" is also registered as a company, and it tells the Company Registrar that it has a healthy cash balance, currently listing its cash assets as £63,000, which happens also to be the "capital employed" by its two directors. One, rather predictably, is Dr Rajendra Kumar Pachauri – who gives his address as 160 Golf Links, New Delhi. But we also have a new (to us) character on the scene. She is Ritu Kumar, the second of TERI-Europe's two directors. Kumar describes herself as an "environmental economist". She is also the company secretary. The next strange - very strange - fact is that you might expect this hub of empire to be registered at a prestigious central London address - in common with the Washington office. Instead, it is located in an unprepossessing Edwardian detached residential house, deep in suburban Merton on the fringes of South London. 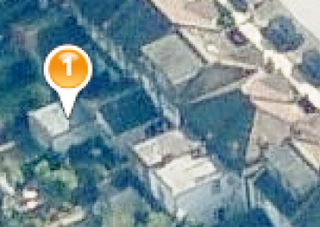 This, Ritu Kumar also gives as her address - 27 Albert Grove, London, SW20 8PZ (pictured, below right). That she gives it as her address is unsurprising. She is what the Land Registry describes as the "proprietor", along with a certain Nicholas Vivian James Robins, who also gives this as his address. The property was purchased for £215,000 on 15 April 1999 - two months before TERI-Europe was incorporated - with a mortgage from the Nationwide Building Society. But this was paid off on 28 September 2001, when Kumar and Robins assumed "title absolute", becoming the legal owners of the property. We will have a closer look at Robins later. To add to the mystery, there is no mention of company directors in the official TERI-Europe website, which claims that the organisation was "set up by TERI India". This it clearly was not. But Pachauri is not listed as a director - only as a "trustee", along with a galaxy of notables, including Sir John Houghton and Sir Crispin Tickell - who would hardly be seen dead in Merton. Ritu Kumar, just as strangely, is not identified as a director either - much less as the Secretary of the company. She is mentioned only as a "contact" - with the Albert Grove address and a TERI-India e-mail. There is also another "contact", a lady called Rochelle Mortier. She has a very interesting cv, currently working for Alexander Ballard Ltd, an environmental consultancy, via Cargill, Coopers & Lybrand and Price Waterhouse and Greenpeace - as well as TERI-Europe. What all makes this so very mysterious is that, despite the incredibly low level of trading, TERI-Europe seems to be able to afford the services of the likes of Mortier, to say nothing of Ritu Kumar, who rather hides her light under a bushel, as far as the TERI-Europe website goes. Furthermore, she seems to have several different versions of her cv. One of the more interesting of these makes it clear that we are dealing with Dr Ritu Kumar, described as "one of India's topmost environmental economists, experienced in issues related to sustainable production, trade, and climate change." We are also told that she is currently Director of TERI-Europe and Executive Director of the Sustainable Trade and Innovation Centre (STIC). Initially government-funded (by the Dutch), STIC is another of those interesting NGOs, with a lot of detail here. In the brochure other funding partners are identified: the Commonwealth Science Council (CSC), UK, the European Partners for the Environment (EPE), Brussels, and the Royal Tropical Institute (KIT), Amsterdam. Kumar is then identified as the representative of the Commonwealth Science Council, giving her address as 27 Albert Grove. In another instance, however, she gives a slightly more prestigious address: Commonwealth Secretariat, Marlborough House, Pall Mall. In a book to which she contributes, edited by Cary Krosinsky and her housemate Nick Robins, called Sustainable Investing, Kumar offers a slightly different version of her cv. Here, we are told that from 2000 to 2006 she was director, UK, with TERI-Europe. That - insofar as it implies that she no longer worked for TERI-Europe after 2006 - clearly is not true. All the official records – and much else – have her currently still a director. But this cv has Dr Kumar from 2006 as a senior adviser on environmental, social and governance issues with Actis UK - a private equity firm investing primarily in Africa, China, India, Latin America, South and South East Asia. She has advised on "environmental, social and business integrity since 2006." The company handles $7.3 billion in investments and has over 100 investment professionals in nine offices worldwide. Thus far then, with a great deal more to cover in what becomes an increasingly murky story, we have a charity which is a company wholly owned by Dr Pachauri and Dr Kumar, the latter who not only works for TERI-Europe but also for a government-funded NGO, the Commonwealth Secretariat and a private equity company handling billions in investment funds - aided by another "part-timer" working for another company. Interestingly, much of TERI-Europe's activities are devoted to encouraging Indian corporates to be more "transparent". As we will see in the next part, though, this does not apply to TERI-Europe. The plot is about to get very much thicker. While British schools are scraping together their pennies in anticipation of funding cuts, hard-pressed taxpayers and parents will undoubtedly be pleased to learn that they are subsidising Indian education, to the tune of £1 million through a project called the UKIERI programme. This is described as a "five-year roll-out of networked partnerships" between UK and India schools, funded by the FCO, the DCSF (Department of Children, Schools and Families), the British Council and the Office of Science and Technology. Although ostensibly directed as schools, however, the small-print tells you that the bulk of the funding goes to the HE (Higher Education) sector. Two principal activities, we are told, will be promoting research partnerships between centres of excellence in sciences/social sciences. A priority is to encourage more doctorate and post-doctorate collaboration between India and UK, through split PhDs or research fellowships. 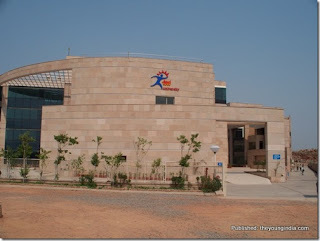 It will this come as no surprise to learn that a major beneficiary of the programme is TERI University (pictured), the chancellor of which just happens to be Dr R K Pachauri, chairman of the IPCC and director general of TERI. Thus, in October of this year, the "university" was able to offer a PhD position "in the area of catalysis." This is partly funded by UKIERI (UK-India Education and Research Initiative) and the research is to be carried out in collaboration with Department of Chemistry, University of Glasgow. Whether the work should qualify for a PhD, though, is an interesting issue, as it has been well and truly explored by numerous authors and was the subject of a paper by TERI itself in November 2007. Only a few months later in January 2008, though, TERI (director-general RK Pachauri) – but not TERI University – was able to announce the funding of a project on "Red mud catalyst for hydrocarbon cracking and carbon adsorbent production." Its sponsor was declared as: "UK-India Education and Research Initiative (UKIERI) ". Original work or not, the outcome – if successful – is likely to have considerable commercial value, along the lines of Pachauri's OBTL venture. Thus, rather than primarily an educational exercise, this looks more like a cross-subsidy for another of Dr Pachauri's money-making enterprises. British taxpayers will be so pleased. "I have to marvel at the irony of all this, and the fact that such stinging cold, and for too many people, lethal, is a product of a world that has simply bought into those that sought to take advantage of them to advance their own agenda. Fortunately, cooler minds (weather patterns) are going to prevail in time to force people to wake up to the idea that this is not a done deal, and far from it, as is my opinion, ICE not fire may be the bigger worry for causing hardship on the planet's life by 2030. They will have no one to blame but themselves, as they built the road that will ride their idea to its death, one that may not deserve to die, but will." Joe Bastardi on his blog. "Elevating any person, or model, to something that you put blind faith in the face of the majesty that is the Earth, and all that surrounds it, has a word – Foolishness," he writes. The Indian company, Oil and Natural Gas Corporation Limited (ONGC), is ranked 152nd in the Fortune Global 500 list of companies. It contributes 77 percent of India's crude oil production and 81 percent of India's natural gas production. The Indian government holds 74.14 percent equity stake in this company which, in the financial year ending 2009, achieved its highest-ever sales revenue of £8.6 billion. And, for the period of June 2006 to June 2009 it had the good fortune to have as one of its non-executive directors a certain Dr R K Pachauri, also director general of TERI and chairman of the IPCC. When it comes to "Big Oil", there are bigger but ONGC certainly qualifies as a member of this club. And at the heart of the beast for three years, at a crucial point in the development of the IPCC agenda, was Dr Pachauri. During that time, though, no one could accuse the good doctor of getting rich out of the deal – not directly at any rate. The company paid its non-executive directors a modest attendance fee only. And for the two years of 2007-08 and 2008-09, such was his pitiful attendance record that he netted only just over £2,000. However, Dr Pachauri is nothing if not good at multi-tasking and networking. And, while diligently looking after the interests of ONGC he was, of course, looking after his own, setting up an offshoot of his institute TERI as a separate company called TERI-Biotech. This company had developed a patented process for the biodegradation of oil, which could be used for extending the productivity of oil wells and for cleaning up oil spills. And its first – and main – client became ONGC, which allowed it to test and refine its process. So successful was the association, we are told, that the two companies, TERI-Biotech and ONGC decided to formalise the relationship, forming on 26 March 2007 a joint venture company called ONGC TERI Biotech Ltd (OTBL). TERI – director general Dr R K Pachauri – holds 47 percent of the equity, while ONGC has 49 percent. The remaining 2 percent is held by financial institutions. Needless to say, the financial contribution to Dr Pachauri's evident wealth has not been recorded, but his continued partnership with "Big Oil" is now set to yield dividends. Reported in April 2009, two months before Pachauri stepped down from the main board of ONGC, the joint venture company had decided to bid for a share of a $3bn UN-funded contract to clean up the oil pollution in Kuwait, left behind by Saddam's invasion. That Pachauri just happens to be a senior official of a UN institution is, of course, a complete coincidence. But his joint company seems remarkably confident of getting a sizeable slice of the work, so much so that it was telling the Indian financial press that it has "a plan to clock a top line of $2.1 billion in the next three to four years." One can only wish the enterprising Dr Pachauri the best of luck in his venture, but it should be recorded that, while the likes of George Monbiot are quick to associate "climate deniers" with Big Oil, no one is actually closer than his all-time hero, Dr R K Pachauri. Do environmental journalists sing to the same hymn sheet? Biased BBC offers some evidence to that effect. When you also get BBC journalists such as Nik Gowing involved climate change conferences as paid moderators, you begin to get the picture. Temperatures are expected to plunge to minus 3°C in most of England and Wales on Thursday night, New Year's Eve, and minus 8°C in Scotland, with widespread snow showers also predicted. New Year's Day will also be chilly, with the northern half of Britain struggling to get above freezing during the day. But don't worry boys and girls. The Met Office is on the case (above). It is "... more likely than not that 2010 will be the warmest year in the instrumental record, beating the previous record year which was 1998." So, turn off that central heating, get out there and enjoy yourselves. This cold is all in your imagination. Although, as The Daily Telegraph observes today, there are many dismissing coal as the unwanted black sheep of the fossil fuel family, coal-fired generation still provides 37 percent of our electricity supply. Moreover, unless or until the lunacy of carbon capture takes hold, it is one of the cheapest means of generation. However, because of the high fuel cost, relative to capital outlay, coal fired generation is sensitive to increased coal prices. Doubling the price would force a 66 percent increase in the retail price of electricity. Yet, it seems, with demand set to rise, price increases are precisely what we are having to confront. 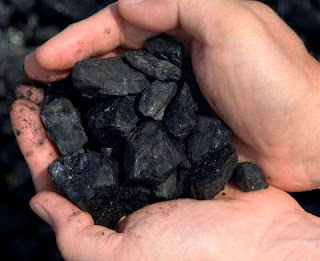 Analysts from JP Morgan, we are told, are forecasting that thermal coal, used in power stations, will rise from $70 to $85 per ton next year. And the direct cause of this is "rebounding demand" from China and India. Part of this is the result of mine closures in the Shanxi region of China and the rise in electricity generation, factors which are expected to drive world stocks down from their current level of 40 million tons to 22.7 million in 2010. But this is only half the story. In the longer term, global coal usage, far from declining, is set to increase substantially. The International Energy Agency believes that coal will account for 29 percent of global energy needs in 2030, compared with 26 percent four years ago, making this rather than "green energy" the key fuel for the future. And, while the focus has been on the increase demand in China, an increasingly important player in the global market is India, not least through the inability of its own domestic industry efficiently to exploit its own reserves. Only this month an Indian parliamentary panel was "shocked" to find "inordinate delays" were slowing development and about 100 coal projects had failed to take off, resulting in a shortfall of domestic coal production. Thus, to fuel a planned expansion of electricity production from 78 GW in 2006 to 142 GW in 2030 – the bulk of it coal-fired – the state-owned Coal India Limited is rapidly forming strategic partnerships with Australia, the US, South Africa and Indonesia in order to secure future coal supplies. More recently, the company has secured an agreement with the Mozambique government to exploit two blocks of land totalling over 220 sq km in which high-grade deposits of coal have been found. The Indians won the bid from nine other bidders, while two bids each from the UK and China were disqualified. 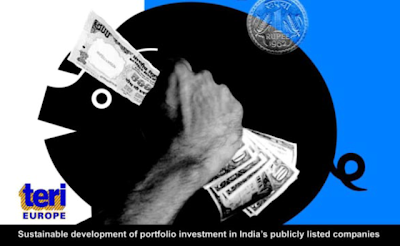 There were a total of four Indian bidders in the process. Elsewhere, Indian interests are highly active in Indonesia where India's National Aluminium Co aims to buy at least 200 million metric tons of coal reserves from the eastern Indonesian islands of Kalimantan and Sumatra in order or secure aluminium production in India. This is in addition to the 4GW Mundra power project in India's Gujarat State which will also be sourcing its 12 million tons of coal each year from Indonesia – and it has eight more such "ultra mega" projects planned with a total combined coal-fired generating capability of 32 GW. The point, of course, is that India – as with China – is in competition with the UK (and the rest of Europe) for this coal resource. Yet, while we are saddling our own generators with increased costs, supposedly to combat global warming, not only are we providing cheap money for Asian development, in the case of India we are actually subsidising the coal plants by allowing them to claim "carbon credits". Fair competition is one thing but castrating our own industries while subsidising our competitors, who are then able to outbid us in the same markets from which we source our energy supplies, is little short of economic suicide. And that is real effect of our government's obsession with global warming. ... we have this (above) from David Attenborough, preaching doom and destruction. And then, on the other hand, we have this, telling us how wildlife is flourishing, helped by a return to traditional weather. In its print edition, The Daily Telegraph managed to put both stories on the same page, which made for an amusing contrast. Characteristic of the many subjects reported by the media these days is the fundamental dishonesty with which they are treated. To add to the EU, climate change and sundry other issues, we can now also add "fuel poverty". This, The Independent plays big today, reporting that more than seven million households struggle to pay their fuel bills, almost double the official estimate. The report is gleaned from an opinion poll for the National Housing Federation, which tells us that two-thirds of people in "fuel poverty" said they heated their homes less than would like because they could not afford the high prices of gas and electricity. 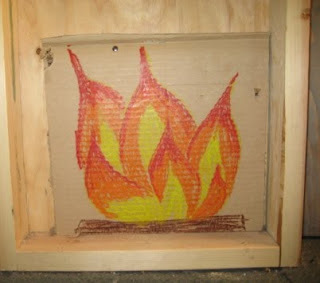 The nearest they get to real heat is a colour picture in a pretend fireplace – the ultimate energy-saving device. But, in this paper's book, the villains are the energy companies which are failing to pass on falls in wholesale costs. Thus, it declares, the research adds to pressure on ministers to take action against energy suppliers to bring down bills and increase social support for vulnerable households to ensure they can stay healthy in the cold. Of course, nothing is mentioned about the hidden subsidy to windfarms (the ROCs), the cost of purchasing carbon credits from the government and the "top-ups" through the CDM system, the climate change levy and the spiralling costs of industry "carbon" reduction schemes, both "voluntary" and compulsory. Not only are these costs never mentioned, they have never been estimated properly and they are certainly not identified. Therefore, average consumers have no idea what they are paying for – and the media certainly is not going to tell them. Then there is the financial drag of our wholly inadequate energy policy, blighted by unrealistic climate change requirements. And, of course, the reason why we are paying so much at the moment is that it happens to be rather cold. Thus, in order to "stop the planet heating up" seven million people are having stay cold. Would that they knew it, many of those shivering in their poorly heated houses would hugely enjoy the irony of their having to freeze to save the planet. However, "dying for your planet" does not have quite the same ring about it as "dying for your country", although Dr Pachauri, ensconced in his multi-million dollar home in Delhi, would undoubtedly approve. 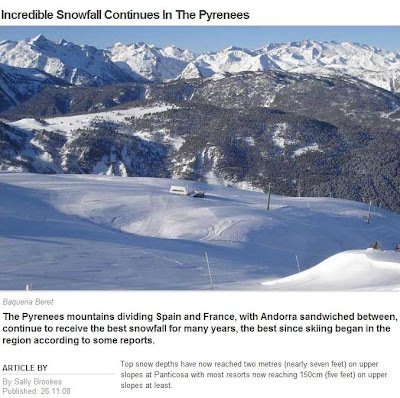 "Global warming to hit Pyrenees resorts," screamed the headline on 18 April 2008. This was a study from Spain's CSIC scientific research agency, which breathlessly declared that ski resorts in the Pyrenees between Spain and France could be badly affected by climate change this century as the warmer weather melts the snows. Temperatures in the mountain range will increase by between 2.8 and 4.0°C between 2070 and 2100, said one of the "experts" behind the study, Juan Ignacio Lopez Moreno. "Because of global warming, the ski season will begin later and the spring thaw will come up to a month earlier," he said. "What is snow today will be rain tomorrow." By late November, however, a slightly different headline had replaced the doomsaying. "Incredible Snowfall Continues In The Pyrenees," it proclaimed, reporting that top snow depths had now reached two metres (nearly seven feet) on upper slopes at Panticosa with "most resorts now reaching 150cm (five feet) on upper slopes at least." "There has been two days of continuous snowfall bringing from 30 to 80 cm (12 - 32 inches) of fresh powder in the Pyrenees and the Cantabrian mountains of Northern Spain," said Skiinf's regional manager for the area, Prof Dr Raúl Revuelta Carbajo. For the Spanish Environment Ministry, though, such inconvenient facts troubled it not. By 25 February 2009 it was happily reporting: "Glaciers in the Spanish Pyrenees Melting Fast" and "Further loss of ice could be catastrophic." The Pyrenees had lost more than 90 percent of their ice during the 20th Century, and if the current global warming trend continued, the remaining 10 percent of ice could disappear within a couple of decades, said Miguel Frances, coordinator of a new study. Yes, "last year there was a lot of snow," admitted Frances. "This stabilized the glaciers but they did not grow." He then confidently asserted: "We need 20 winters like this one, which is a one-off." But so much for the "one-off". By 15 December, the headline read: "Spain Hit By 'Siberian Effect'." 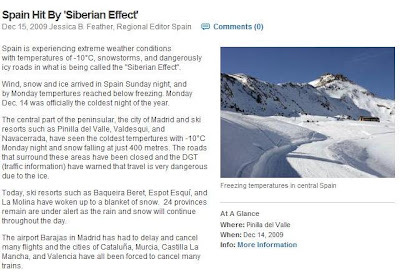 Spain was in the grip of extreme weather conditions with temperatures of -10°C, snowstorms, and dangerously icy roads in what was being called the "Siberian Effect". Wind, snow and ice had arrived in Spain on the Sunday night and by Monday temperatures had dropped below freezing. Monday 14 December was officially the coldest night of the year. Ski resorts were amongst those to experience the coldest temperatures. Snow fell at just 400 metres. 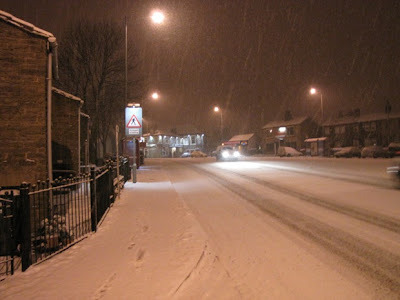 The roads surrounding the areas had been closed. And how many more "one-offs" do you think we need before the warmists are a laughing stock? "Breaking news" in Kenya's The Nation today tells us that Lake Chad was bigger than Israel less than 50 years ago. Now, we aare told, its surface area is less than a tenth of its earlier size, amid forecasts the lake could disappear altogether within 20 years. And, of course, the cause is ... climate change, with a walk-on part for "overuse". 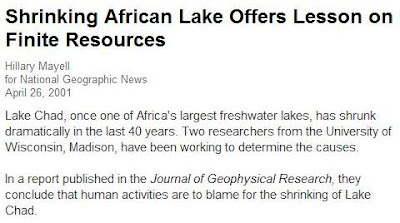 These factors have put one of Africa's mightiest lakes in mortal danger, and the livelihoods of the 30 million people who depend on its waters is hanging by a thread as a result. 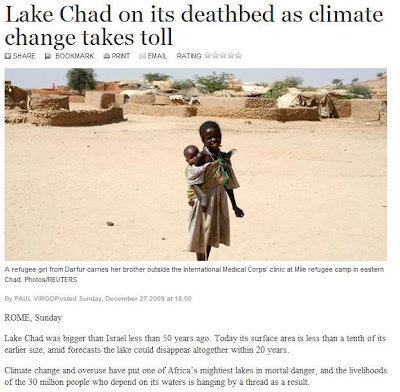 The National Geographic News for 26 April 2001, however, had a slightly different story, recording how two researchers from the University of Wisconsin, Madison, have been working to determine the causes of Lake Chad's shrinkage. In a report published in the Journal of Geophysical Research, they concluded that human activities were to blame. Interestingly, Pajamasmedia notes today that, in the year Obama was born, Kenya had higher per capita income than South Korea. The reasons for this and the current situation with Lake Chad are not entirely unrelated. The one thing for sure, it is not currently, lack of water. Even the BBC admits that "other factors" include "irrigation and the damming of rivers feeding the lake for hydro-electric schemes." From The Independent on 20 March 2000 we got the headline: "Snowfalls are now just a thing of the past". 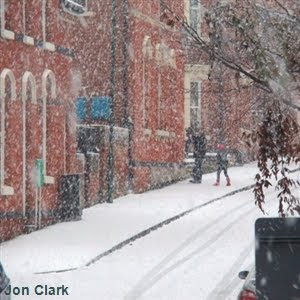 According to Dr David Viner, a senior research scientist at the climatic research unit (CRU) of the University of East Anglia, within a few years winter snowfall will become "a very rare and exciting event". Then, from the Telegraph online today we get: "Snow and ice to hit Britain at New Year." The forecast follows a spell of snow, sleet and ice which has gripped Britain for more than a week but relented in most parts over recent days. It is so good to see in The Independent that the CRU is living up to its justly acquired reputation for accuracy. Following our publication of details of some of Pachauri's earnings, gleaned from an Indian newspaper, we attributed some $300,000 income to which Pachauri had admitted. However, now we have seen the original copy of the press release issued by TERI, it seems we may have significantly underestimated even that amount. In the entry for Yale University, we see the sum of $48,750 declared. But alongside this, we see the legend: "Monthly payments received upto (sic) 30th Nov 2009." There is an element of ambiguity here, but the $48,750 could either be the total payment from Yale, or it could be the monthly payment. If it is read as the latter – which is how it actually reads - that would produce an annualised figure of over $500,000 ($585,000 to be exact). This is closer to the sums paid for "star" performers. The classic example is Tony Blair who was paid $200,000 by the university after a deal to give seminars ten times a year on religion. Like Pachauri, Blair "laundered" the fee through his own set-up, in this case the Tony Blair Faith Foundation, although he also took a direct fee of $10,000 from the university for a speaking engagement. The balance, after tax, was paid to his foundation. Certainly, Yale University has enough money in the kitty to pay Pauchari more than half a million a year. The Climate and Energy Institute to which he was been appointed head has been funded to the tune of $3 million, provided by an "anonymous donor," a base on which it aims to build "via private donor contributions." Who these anonymous donors are, of course, we will never know, which makes the University itself a perfect way of laundering payments to Pachauri. By the time they have been transferred to the university and then TERI, they have passed through two "cut-outs" and are entirely untraceable. With his Yale fee, though, Pachauri's known earnings are in the $800,000 bracket, and these only cover some of the organizations we named in our article. Add the rest, plus Pachauri's payments from the IPCC, and he must easily be in the million-dollar bracket for his annual earnings. Yet, about how much of that is paid to Pachauri by his own TERI, he remains curiously reticent. That is the conclusion of the Booker column today, phrased in reference to the increasingly profitable climate change industry. To get there, Booker brings us up to date (almost) with the latest developments in the Pachauri saga and poses the questions Dr Rajendra Pachauri still has to answer about his extra-mural activities and his private earnings. There is nothing new, of course, to readers of EU Referendum – and we have a lot more to unravel before we have finished with Dr Pachauri. He very much seems to be in the business of making money out of global warming – even if there has been no discernable warming trend since 1995. However, this piece is also the answer to Pachauri and his pet company TERI, which has been issuing threats and bluster all week, the latest of which are recorded here. These have invariably culminated in a demand for an "unqualified apology" from the Telegraph for what is still described as a "libelous piece of journalism", otherwise they will "do such things ..." couched in terms of them preparing to "take recourse to other measures as we consider appropriate and necessary." Interestingly, despite our piece having been published on 20 December, up to press the paper has heard nothing directly from Dr Pachauri, his institute or any of his associates. Over term, we have been at the sharp end of any number of complaints and it is extremely rare in our experience to have heard absolutely nothing directly from a complainant after well over a week. This rather suggests that Dr Pachauri is engaging in bluff and bluster for domestic consumption. However, in describing our report as "a pack of lies" and accusing us of being part of that same "powerful vested interest" responsible for "Climategate", while also demanding an apology, Pachauri is rather climbing out on a limb. As it stands, we have no intention of making an apology, and he is going to look rather silly when one is not forthcoming. Rather, we intend to use the additional material we have, cementing in the proposition that the chairman of the IPCC is abusing his office, if not for his own personal enrichment, then for the benefit of his institute, over which he has control, and from which he may gain considerable financial benefit. Nothing has better illustrated that Dr Pachauri has something to hide than his reluctance to publish the certified accounts of his institute, and its many offshoots, or give details of his own personal salary and emoluments while in office. That he should then respond to the charge that TERI's accounts are not published with the claim that they are supplied to the relevant tax authorities is simply laughable. Pachauri may get away with this in front of a fawning and uncritical Indian and regional media, and he has so far been able to rely on the rest of the British media ignoring the issue. However, as Booker demonstrates today, The Sunday Telegraph is not going to let go. Neither will this blog and many other blogs are joining in the fray – once again they, rather than the MSM are making the running. By the time we have stitched this together, we will be able to show with some greater clarity the web of corruption and deceit that reaches into the heart of the IPCC and spreads its net globally, lubricated by billions of dollars with the promise of many more to come. When it is all over though, we should have difficulty in being the least surprised. The IPCC is, after all, a UN institution, the same fundamentally corrupt organisation that brought us "food for oil" and other such delights. That anyone expected "climate change" to be handled any differently, or any less corruptly, should be the only surprise. Attendees at the inaugural Deutsche Bank Leadership Forum in Berlin on 4 June this year were there for a specific purpose. Unashamedly, the "DB Leadership Forum", as the Bank likes to call it, exists solely to discuss "Business opportunities in addressing climate change". Would that they knew it, one of their keynote speakers was a living testament to the "business opportunities" so afforded. This was none other than Dr Rajendera Pachauri, whose TERI business was being paid €100,000 (that we know of) for his membership of the Climate Change Advisory Board of Deutsche Bank. Whether TERI was paid separately for its Director General's guest appearance in Berlin, we have not been told. However, it would appear that Dr Pachauri is not exactly heavily taxed by his duties for the Advisory Board. On its inception in April 2008, its members were scheduled to meet with the Bank's own Environmental Steering Committee (ESC) twice a year. We are told also that, in addition to these two main meetings, the two committees conduct an ongoing dialog in smaller committees dealing with specific topics, such as energy efficiency. Nevertheless, even the generous payment for Dr Pauchauri's services seems not to have been sufficient for the chairman of the IPCC. For its first meeting on 2 April 2008, according to official UN documentation, Dr Pachauri also claimed this meeting as part of his "outreach" activities on behalf of the IPCC. To attend this meeting, Dr Pachauri flew 3,676 miles from Addis Ababa to London on 30 March, where the business recorded is the advisory board meeting, a meeting with Mr Caio Koch-Weser vice chairman of the Bank and a meeting with Emma Duncan, deputy editor of the Economist. From there, Pachauri flies – again at IPCC expense – a further 924 miles, this time to Budapest for the 37th Session of the IPCC Bureau on 6 – 10 April. On the face of it, therefore, this appears to be another example of Dr Pachauri working for his own commercial interests while booking his expenses to the IPCC. You could, perhaps, take the view that Pachauri's meeting with the Economist's Emma Duncan might have justified the trip – except that Duncan does not seem to have been acting in a journalistic capacity. She is perhaps more concerned with the forthcoming Economist conference, entitled, "The Carbon Economy: New Opportunities for Green Business". At the time, this was being organised by the Economist, to be held on 17-18 November 2009 in Washington. Pachauri was to be a keynote speaker – his fee is not recorded. On that day of 2 April, though, Pauchauri, has yet other interests. His separate meeting with Mr Caio Koch-Weser, clearly yields dividends. On 26 June, less than two months after the meeting, Deutsche Bank announces the launch of a Deutsche Bank Scholarship for the MBA (Infrastructure) programme at the TERI University in Delhi. A Memorandum of Understanding (MoU) to this effect is signed by Dr R K Pachauri, the Chancellor, TERI University and Mr. Caio Koch-Weser, vice chairman, Deutsche Bank Group. Commenting on the partnership, Mr. Koch-Weser says, "I am delighted that Deutsche Bank has joined hands with TERI." The assiduous courting of Koch-Weser has paid off. Pachauri's meeting with the Bank's vice-chairman on 2 April was by no means the first. They also meet on 3 October 2007, at the international lecture by The Royal Academy of Engineering in London, and also with the Academy president, Lord Browne of Madingley, who is also later co-opted on the Bank's advisory board. 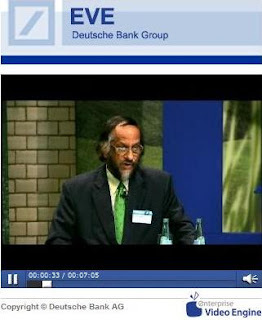 Koch-Weser and Pachauri then meet on 17 January 2008, this time at the Carbon Trust Winter Lecture, also in London. Both of these meetings, incidentally, are claimed as part of the IPCC chairman's "outreach" activities. And, strangely, there is no further record of a Deutsche Bank advisory board meeting until 14 November 2008. We have not yet been advised whether Pachauri claimed the expenses from the UN. For the record, they do meet yet again, at the World Sustainable Development Forum on 5-7 February 2009, where the Delhi Sustainable Development Summit of 2009 is holding a conference under the title "Towards Copenhagen: an equitable and ethical approach". Koch-Weser, by the way, is chaired by Mr Nik Gowing, main presenter of the BBC World Service. 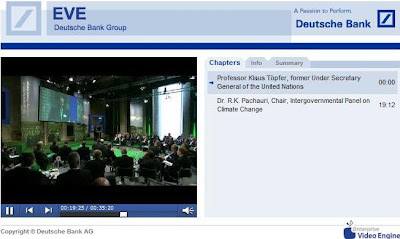 As for Deutsche Bank, it actually has four billion reasons for its interest in climate change and Dr Pachuari, something which its website so clearly explains. Having identified climate change as "one of the mega-trends that would drive the global asset management business for the next generation and beyond," it has become "one of the leading climate change investors in the world." As of March 2009, it had approximately $4 billion under its management. At a mere €100,000 - so far declared - they might think Pachauri comes relatively cheap. ... and a happy global warming to all friends and readers of EU Referendum. This, we are told, is the season of goodwill to all men (and women). It isn't, of course, but the fiction survives. It is but a brief interruption of hostilities on the one day of the year (incarceration excepted) when we do not blog. The photograph, by the way, was taken yesterday, depicting global warming in full force on the northern outskirts of Bradford. And we're getting off lightly - there's mayhem out there. ... for the residents of China's Xinjiang province. After blizzards that started on Tuesday, a cold snap brought freezing temperatures and snow to the northwest, spreading to north and central regions, with temperatures plunging to as low as minus 40°C. Today, the average is -30°C. More than 20,000 people have suffered damage to their homes or economic losses estimated at $1.5 million dollars) in Altay Prefecture in northern Xinjiang. More than 1,300 livestock died and almost 2,000 homes have been damaged while 34 collapsed under the snow. More than 100 vegetable greenhouses and livestock sheds also collapsed. The local government has deployed 57 disaster relief teams. The international airport in Xinjiang's capital Urumqi was closed earlier this week due to snow, leaving nearly 4,000 passengers stranded. The snow also cut off power and heat supplies in Yining, a city of 430,000 people, overnight from Tuesday. 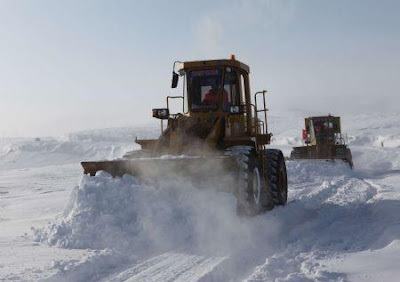 Meanwhile, we are told, the cold snap - a result of extremely cold air temperatures in western Siberia - is moving south, bringing wind and snow, and would drop temperatures by an average 10°C in the northwestern provinces of Gansu, Qinghai, Shaanxi and Ningxia Hui Autonomous Region. The cold is even expected to hit Peking, with winds of 25 mph adding a severe wind chill. As far apart as the USA, in Europe and in China, we have extreme cold conditions plus record or near record snowfalls. 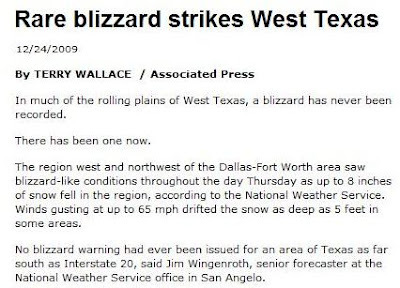 In the US, for instance, we have reports of a "massive winter" storm moving eastward in a swath from Canada down into Texas. "This is a life-threatening system and any travel from tonight through Saturday will be treacherous, if not nearly impossible in many areas," says the National Weather Service. And they reckon there's global warming? They are out of their tiny frigging minds. The Met Office has really excelled itself today - see forecast above. 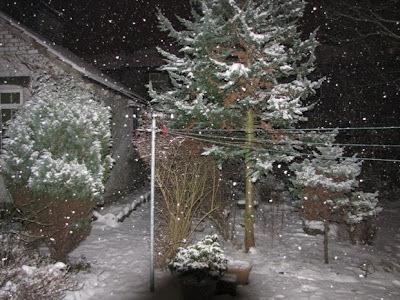 Heavy snow overnight and now snowing heavily again - the heaviest I recall since the 60s and unprecedented for Christmas eve. Traffic at a standstill, and side streets socked in. Bitterly cold, no wind and low, overcast sky. Pretty grim for many travellers, with a distinct North-South split. In a press release purporting to rebut our Sunday Telegraph piece, Dr Pachauri's TERI – of which he is Director General - admits to receiving over $300,000 for "services rendered by Pachauri." This, however, only covers "some of the payments made to TERI". It includes €100,000 from the Deutsche Bank, $25,000 from Credit Suisse and $80,000 from Toyota Motors. The institute also received $48,750 from Yale University, $4,425 from the Asian Development Bank - which has given loans to Tata - and €1,200 from the French electricity giant EDF. At current conversion rates, that totals $302,746. The periods for which the payments were made are not specified and neither are the precise "services rendered" identified. 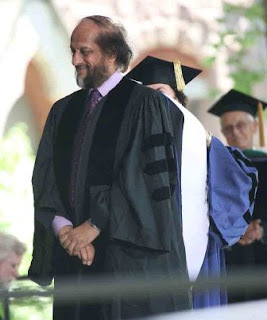 For some organisations, such as Yale University, Pachauri performs more than one service – and his current post as head of the Climate and Energy Institute has only just started. Pachauri's institute denies that it has received any payment from the Risk Governance Council in Geneva, the Chicago Climate Exchange, or the New York Investment Fund Pegasus for which he is "strategic advisor". This is difficult to believe in respect of the latter two, but the phrasing of the "rebuttal" does not rule out the possibility of benefits in kind being offered by these companies. No mention is made of Pachauri's other current posts. Thus, we know nothing of payments (if any) from GloriOil, Siderian ventures, the Rockefeller Foundation, the Nordic Glitnir Bank, the Indochina Sustainable Infrastructure Fund, SNCF, his work as a Hindustan Times columnist, the Asian Energy Institute, FEOP (Far East Oil Price) Advisory Board, the International Solar Energy Society, the World Resources Institute or the World Energy Council. Nor do we learn whether payments were made for Dr Pachauri's work for the Indian government, in particular the National Environmental Council, the Economic Advisory Council and the Oil Industry Restructuring Group. Nor is it specified whether he is paid for his role on the Governing Council of the India Habitat Centre. Other notable omissions are, as admitted by Pachauri, the "sometimes pretty generous honoraria, for giving talks in various places" - which themselves could amount to millions of dollars. As to why TERI's (Indian) accounts are not published, the reason given is that TERI has tax-exempt status in every country in which it operates. "Such status is granted on the basis of proper auditing of accounts and proper scrutiny of documents." Nonetheless, accounts are published in the UK and the US relating to local operations, but not in India. 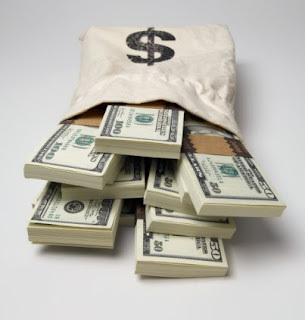 The US IRS return for the TERI-NA operation in Washington identified a total revenue of $66,701 against expenses of $121,810, leaving a loss on the trading year ending in 2009 of $55,109. The expenses included two remittances totalling $54,000 to TERI India. Also identified is a payment made to Dr Pachauri from a "related organization" – which is not identified – of $45,791. This is the only public record of which we are aware which identifies a direct payment to Dr Pachauri. Neither Pachauri nor TERI have chosen to reveal payments made to him by TERI or his salary and other emoluments from the IPCC. Despite that, TERI is claiming as "unfounded and false" our charge that Pachauri holds posts in a number of organisations, including Credit Suisse Bank, and is silent about the money he earns, "which must run into millions of dollars". Yet nothing so far offered by way of evidence would even begin to rebut that charge. And neither has there been any attempt so far to explain how a UN official can work on a fee-paying basis for organisations such as the Deutsche Bank and Credit Suisse, without there being a potential conflict of interest. I should have saved the local Met Office forecast because, as I recall, the weather was going to turn yesterday and we were going to have rain clearing away the snow. As it is, after a cold, crisp day, we had the longest period of sustained snowfall we have so far had in this cycle (pics above and below). 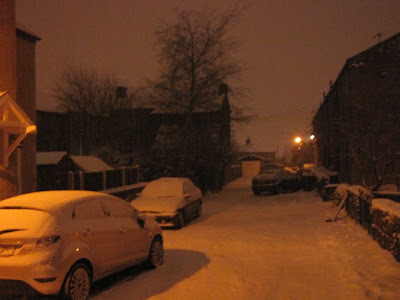 Unless the weather does turn, in Yorkshire we are set to have the first white Christmas in living memory. And, apart from the travel chaos, which has caused untold misery and disruption, we saw yesterday a possible sign of things to come when The Daily Telegraph reported on how the snow and freezing temperatures have meant that the Brussels sprout harvest has had to abandoned in parts of Norfolk, Lincolnshire and much of the south east of England. 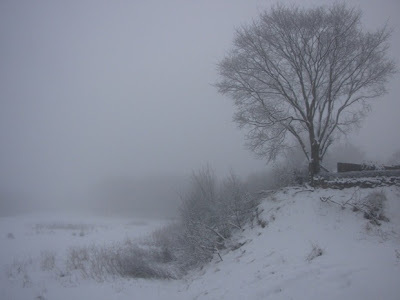 This is also picked up by the Farmers Guardian which has Phillip Effingham, chairman of the British Brassica Growers' Association, telling us: "The last time we had snow like this in the week running up to Christmas was in the mid-1980s "
"We've ground to a halt in Lincolnshire," he says. "It's been impossible to get any mechanical picking done. I think there over the next few days shoppers will notice a real shortage of loose sprouts." Without mechanical pickers, however, TJ Clements, one of the country’s biggest sprout growers, has had to draft in hundreds of extras workers to pick the harvest. The grower said 10 percent of the crop may have to be destroyed. This is small beer compared with what more severe weather could do, but it is a timely reminder of the vulnerability of agriculture to cold weather. Needless to say, there are no strident calls from the warmists, telling us to prepare for the coming cooling, but as we noted only recently, with just a few severe winters we could be in serious trouble. Nothing less than the security of the global food supply is at stake. According to those self-same warmists, of course, this is not supposed to happen. Food shortages they will predict – but only arising from warming. But the cold is a much more deadly enemy, and it looks as if nature could be about to remind us of that fact. The Energy and Resources Institute (TERI) has expressed pain over the "unfounded and motivated" attack against the institution, especially its head R K Pachauri, in a leading UK newspaper. It was ridiculous to suggest that TERI was a company about money and did not ever publish its accounts because it was registered under the Societies Act and submitted detailed an audited account to the government, they said. Thus do they confirm that they have never published their accounts. Dr Pachauri has some powerful friends. And these men are demanding an unqualified apology from the newspaper for the "libellous" piece of journalism, "failing which the institute would take recourse to other measures it would deem appropriate." I guess we're off their Christmas card list then. I knew that there was something missing in my life ... that gaping void, that unrequited yearning. And then, suddenly, all is well with the world. The Daily Scarygraph has resumed its global warming "scare of the day". With some things, you don't realise how important they are until they're not there. The French government is buying 129 Viking all-terrain amphibious armoured vehicles from BAE systems, for a mere £220 million, including a servicing contract. Could it be that French military procurement is even more incompetent than the MoD? Surely not! The mighty Rajendra Pauchauri, multi-millionaire extraordinaire, is now working terribly hard on trying to salvage his tattered reputation – but the harder he tries, the deeper he digs himself into a hole. His latest effort is in the financial journal Thaindian where he tries to deny links between his institute, TERI, and Tata. " ... we decided in 2001 to retain the acronym and change the expansion. 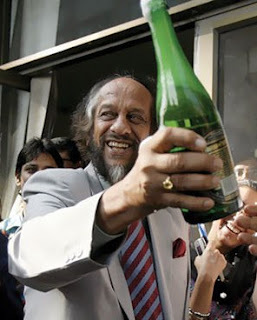 This signifies our independence from any direct Tata connection," Pachauri tells the journal. Actually, the great man's memory is a little faulty. The "expansion" was changed in January 2003, not 2001 as he asserts – just after he had been appointed chairman of the IPCC. As significant, look how the message is changing. He tells the Times of India on 21 December that, "Our ties ended when Darbari Seth, who was on our board, died in 1999. We haven't received a single penny from Tatas for years and have no ties with them." Now the time-frame shifts from 1999 to 2001 and instead of "no ties" we have no "direct Tata connection." So, having Dr Jamshed J Irani, Director of Tata Sons Limited, on the TERI Advisory Board is an indirect Tata connection is it? As to our report that Pachauri "was part of groups, including green firms, which benefited from IPCC's recommendations, terming this a conflict of interest," with his rejoinder, the great man digs himself in even deeper. "[the] IPCC makes no policy recommendations ... There is nothing in this report that could have any proprietary benefit." Dr Pachauri needs to do a little better than that. The IPCC does make policy recommendations. Has he not read this speech on 7 December in Copenhagen. "This conference must, therefore, now lead to actions for implementation by "all parties, taking into account their common but differentiated responsibilities," it says, and we also get: "This conference must also lead to urgent initiation of large scale mitigation actions." The speaker may be a little bit familiar to Rajendra. He is Dr Rajendra Pachauri, Chairman, Intergovernmental Panel on Climate Change (IPCC). As to "proprietary benefit", he ought to listen to his boss, UN Sec-Gen Ban Ki-moon. Only the other day, he was telling reporters that businesses are bound to profit from a world-wide agreement on climate matters. "... I'm sure that the business community will shift their business operations towards a green growth economy." As we, observed earlier, our Dr Pachauri is not only a liar - he is not even a very good liar. He needs to try harder - we know he can, viz his experience in the Delhi High Court of suppressing material facts swearing to false affidavits. This is getting too easy. Yes, I advise a number of organisations, both in India and overseas. And some of them are, you know, banks like the Deutsche Bank and they do provide payment for it. But each penny of it goes to my institute. I never take a single penny for myself. So much so I get honoraria, sometimes pretty generous honoraria, for giving talks in various places, but the cheque goes directly to my institute. Then what? How much does his "institute" pay him? Houses in Golf Links Road don't come cheap. And then there's the servants to pay. Nevertheless, says Pachauri, "My record is impeccable. I've always been totally scrupulous about every single penny's transaction. So I'm certainly going to take action on this ... ". But, asked whether he would take legal action, the great man would not commit himself. "I'll decide what kind of action, they're going to hear more about it." So far, we haven't heard. On the one hand, you get a group of students preparing for "a once-in-a-lifetime journey to the South Pole to see the effects of climate change for themselves." On the other hand, you get Dutch researcher Machiel Lamers in the paper with: "Eco-tourists blamed for melting polar ice caps." Eco-tourists travelling to Antarctica are adding to global warming which is melting the polar ice caps, we are told. Mind you, if these students really wanted to see the effects of "climate change" for themselves, surely all they have to do is look out the window. Richard D North pleads not guilty to the piece in The Mail on Sunday and has promised to send the cheque on. Actually, the Mail has sorted it. Their response was fulsome, rapid and apologetic. 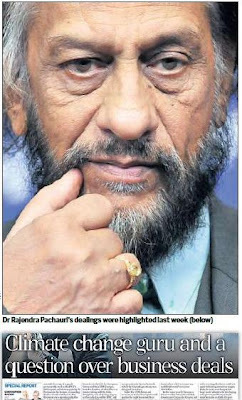 "We ... have no ties with them," Dr Pachauri told The Times of India, only a few days ago. We were not impressed then and are even less so now with an article in The Hindu being drawn to our attention. Dated 6 June 2007, it reports on the Indian government having announced "the constitution of a high-level advisory group on climate change." Known as the Prime Minister's Council on Climate Change, purpose was (and is) to coordinate National action plans for assessment, adaptation and mitigation of climate change. Its other duties included advising the government "on pro-active measures that can be taken by India to deal with the challenge of climate change," and to "facilitate inter-ministerial coordination and guide policy in relevant areas." Its official membership comprised Indian government ministers, but it also co-opted a number of non-official members. These included multi-millionaire businessman Dr R K Pachauri and multi-billionaire businessman Ratan Tata, chairman of Tata Sons, the holding company for the Tata Group. Still, the Hindi media are taking note, and someone suspects that I might not be a nice person. Dr Pachauri is already convinced. Many people will remember the strident headline at the end of November blaring: "Western lifestyle unsustainable, says climate expert Rajendra Pachauri". That was the version in The Guardian, but other papers carried something very similar. How so very different might have been the reception had the newspapers carried a photograph of the house occupied by multi-millionaire businessman Dr Rajendra K Pachauri, currently 160 Central Golf Links Road, New Delhi. 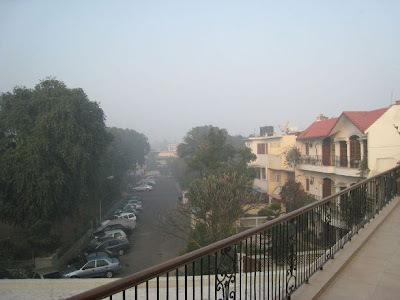 This is situated in a delightful residential area (pictured above and below) very close to Khan Market, the most expensive market in India. It is described as one of the most expensive places to live in India. The cheapest houses sell for millions of US dollars. 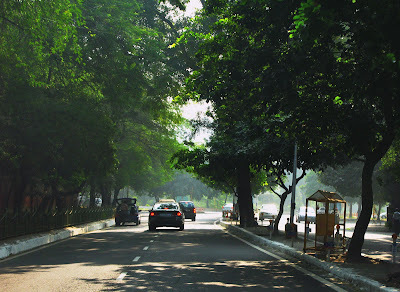 It is considered one of the richest neighborhoods in India and the name is inspired by the Delhi Golf Course nearby. It has only 210 detached houses. Methinks that a man who lives in a house worth millions, travels nearly half a million miles in 19 months by air and then tells us our lifestyles are "unsustainable" might possibly qualify for the label "hypocrite". 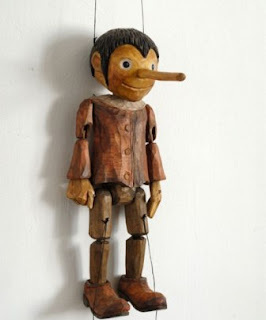 As for being a liar, it seems we are not the first to suggest this of Dr Pachauri. Amongst others, we have K Ramamoorthy, who in 1996 was a High Court Judge in Delhi. After hearing the case of Old World Hospitality Pvt Ltd (Plaintiff) vs India Habitat Centre, he handed down a judgement against the Habitat Centre after it had arbitrarily and in breach of its contract, dismissed Old World Hospitality as suppliers of hospitality services to what was one of the largest conference centres in India. The details are set out here and need not detain us greatly. Suffice it to say that the Habitat Centre's defence rested on a claim that the Governing Council had not approved the original contract, and therefore the contract was not valid. On the Governing Council was a certain Dr R K Pachauri, who gave sworn evidence to the effect that the agreement "was never brought up for discussion nor was any analysis on the implications of the same ever submitted to the Governing Council." Rejecting that submission and those of the others, the judge observed that, "The members of the Governing Council must have been aware of what was going on," adding: "If they want us to believe that they did not have any knowledge of the agreement, I am afraid, they demonstrate themselves totally unequal to the task entrusted to them." And I am afraid, that the affairs and the efficient management of the Centre are not safe in the hands of officers like ... Dr R K Pachauri ... and they had ignored that the officers have to function as a public functionaries within the parameters of the Constitution. A year after that judgement, Pachauri was elected to become co-chair of the IPCC. He is still on the Governing Council of the Habitat Centre and between September 2004 and September 2006 was its president. Now, this multi-millionaire businessman is still calling our work a "pack of lies" and is demanding an apology. The second word of the response I have in mind is "off". Booker, on Sunday, might be less terse.